I’ve been spending a lot of time on Google+ lately. There’s a reason for that. Simply put – Google Plus rocks! 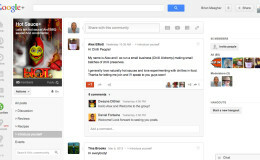 Are you already using Google+ ? If so tell us in the Comments below. And shoot us a link to your profile or page. I’m loving the HotSauce+ community already! I posted a simple question and quickly got some awesome responses. This one is a sure follow. I like Google+ but need to spend more time there, especially on Android to figure out how it works. Would love to see more of you Chris on G+.